LG’s Watch Urbane is one of the best-looking Android Wear watches you can buy (admittedly, not a high bar). The second edition takes the same formula, and adds a sprinkling of LTE. Oh, and there’s a bonkers new smartphone with two screens. The LG Watch Urbane Second Edition isn’t too different style-wise: a round P-OLED screen with an all-metal body are the main things here. But internally, there are upgrades: a 4G LTE chip (a first for an Android Wear smartwatch) means you aren’t tethered to your phone, there’s a screen bump to 480x480 pixels, and a Qualcomm Snapdragon 400 processor quaterbacking the show. Unfortunately, that spec bump also comes with a thicker case: it’s 14mm deep, which means you’re basically wearing a deck of cards on your wrist. That screen, processor and 4G radio also probably won’t do nice things to the battery life. Availability and price are still up in the air, although it will be launched initially in the US. 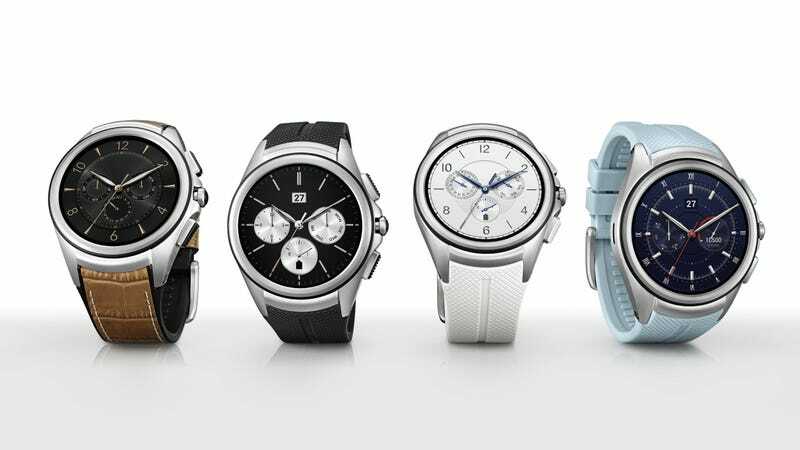 Alongside the (somewhat sane) watch, LG is also hitting us with a new phone. Named the V10, it’s a 5.7-inch Android device that’s relying on a second screen to make it stand out from the crowd. The second screen sits above the main display, where it’s always on. When the main screen is off, it shows weather, date and time and the like; power the main one on, and it’s a shortcut bar to your favorite apps. Apart from the zany screen, it’s exactly the sort of high-end Android device you’d expect in 2015: steel and rubber construction, QHD+ display, Snapdragon 808 processor, 4GB of RAM, 64GB of storage with a microSD, a removable 3000mAh battery, and a fingerprint sensor. Oh, one other quirk: there are not one but two selfie cams on the front, with 120-degree and 80-degree lenses, for your wide-angle Snapchatting pleasure. Looking at those specs, it seems like a spiritual replacement for the LG Optimus G Pro, a giant phone with equally gargantuan specs. With those two screens — one of which is already a whopping 5.7-inches, this certainly isn’t going to be a phone you could describe as ‘small’ or ‘manageable’. But with those guts, it’s not going to be a slouch either. Price isn’t announced yet, but we do know it will be available in black, white or a light-blue ‘coral’ sometime in November.